Alien: Covenant fits in nicely to the Alien franchise as a sequel to Prometheus and a prequel to the original Alien movies. The rumor is that it will be part of a trilogy from director Ridley Scott, and based on the way it ends this would not surprise me. 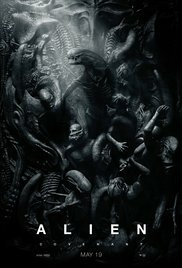 Alien: Covenant has a whole new crew and the actors playing them are: Michael Fassbender, Katherine Waterston, Billy Crudup, Danny McBride, Demián Bichir, Carmen Ejogo, Jussie Smollett, Callie Hernandez, Amy Seimetz, Nathaniel Dean, Alexander England, Benjamin Rigby, Uli Latukefu, Tess Haubrich, and James Franco. After the events of Prometheus, we are introduced to the Covenant, a new ship with more than 2000 life forms on a mission to colonize a new planet. The crew is awakened early from their deep sleep, and soon they receive a signal from a planet that is much closer than the one they intended to visit. They decide to go to the closer planet and that's when things start to go wrong. In my opinion, Alien: Covenant answered any remaining questions from Prometheus and then really dove into the world Ridley Scott wanted to tell. We saw the origins of the creator's home world and also the person who actually created the Xenomorph from the original Alien Movies which was pretty cool (and disturbing).The film might start off slow for some, but it's the dialogue and the story that make a film like this amazing. The cast was great and you will be pleasantly surprised with how Danny McBride handled his serious role. I want more of what Ridley Scott has created, and if you're a fan of his you'll enjoy this flick as well. Go watch the crew of the Covenant take on the big bad Aliens and see who make it out alive.